It’s been 8 months since UK Games Expo 2017, and there were a couple of games that I’ve regularly been checking the progress on in that time. One of them is Escape the Dark Castle, a cooperative dice rolling adventure game for 1 – 4 players. It’s hard to describe why Escape the Dark Castle was one of my favourite games of the expo. It doesn’t look like much. 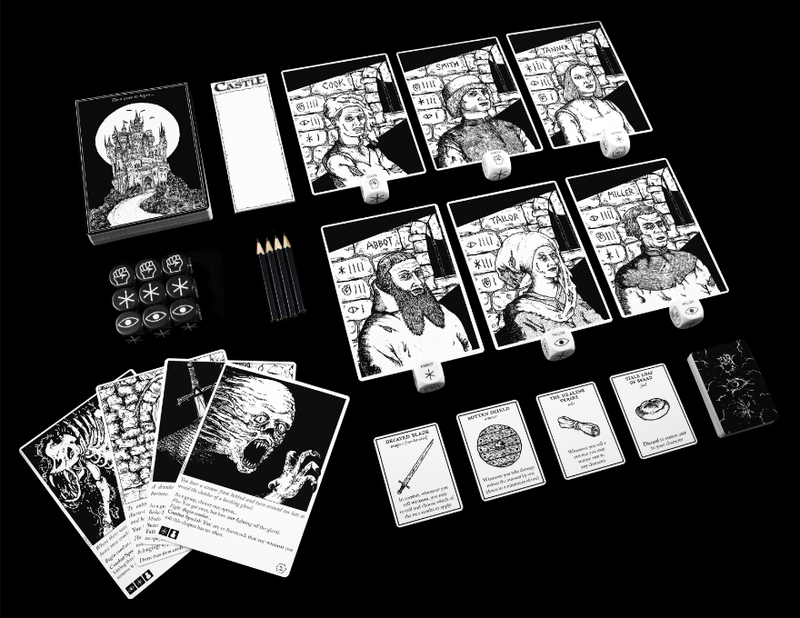 The artwork is monochrome and simple, the rules can be learnt in just a few minutes, there are no standout characters to play, and no fancy or complicated game mechanics. 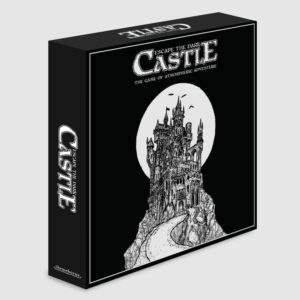 The simplicity of the game means that it’s accessible people new to tabletop gaming, and yet, Escape the Dark Castle is far from boring. Players use character dice which are weighted dependent on that character’s skill set. You progress through the deck of chapter cards one at a time, defeating any opponents you come across, and keeping track of your health as you go. You may collect items to help you on your quest, and at the end of the game, you have one final boss to defeat. Only if all players survive to the end will you succeed in escaping the dark castle. Sounds pretty basic right? But what makes this game so special is the theming. After years of incarceration in the depths of the dark castle, you finally break free of your cell. You hear footsteps approaching. You must not linger here. Each time you play Escape the Dark Castle, your quest will be different. 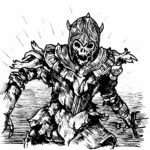 From the 45 available chapter cards, just 15 are randomly selected to form each quest, and your final boss is another random selection from The Dark One, The Demented Priestess or Terror of the Underworld. If you were wondering if one was easier than the others, I can tell you now that they’re all pretty horrible. On top of most of the chapter cards throwing some malicious challenge your way is the accompanying story. Escape the Dark Castle probably has the best accompanying atmospheric adventure story of anything I’ve played before. I’m not one to be engrossed in the story behind a game, I’m usually more of a ‘get on with it’ type of player. Yes, the overall theming is appealing and a good story can help to move the game along, but I rarely pay attention to the storytelling behind the game, except in this case. Not only is the storytelling good, but I came to enjoy turning over each chapter card to see what the writers had in store for us. Yes, it was always going to be something horrific which could potentially kill us, but I loved the way the game presents its challenges. It took me back to the Fighting Fantasy stories of my youth, to watching Knightmare on TV, and to the old text-based adventure games I would play on my Acorn Archimedes. Chapter cards don’t just tell you what might kill you, but they often also give you a choice. In addition, combat rolls required for each opponent differ every time you face them, adding further to the random elements included in each quest. The simplicity of the game, combined with a multitude of options makes Escape the Dark Castle highly replayable. Oh, and did I mention? It’s not easy either! In all honesty, I haven’t successfully escaped the castle once yet, which makes me want to play it even more. 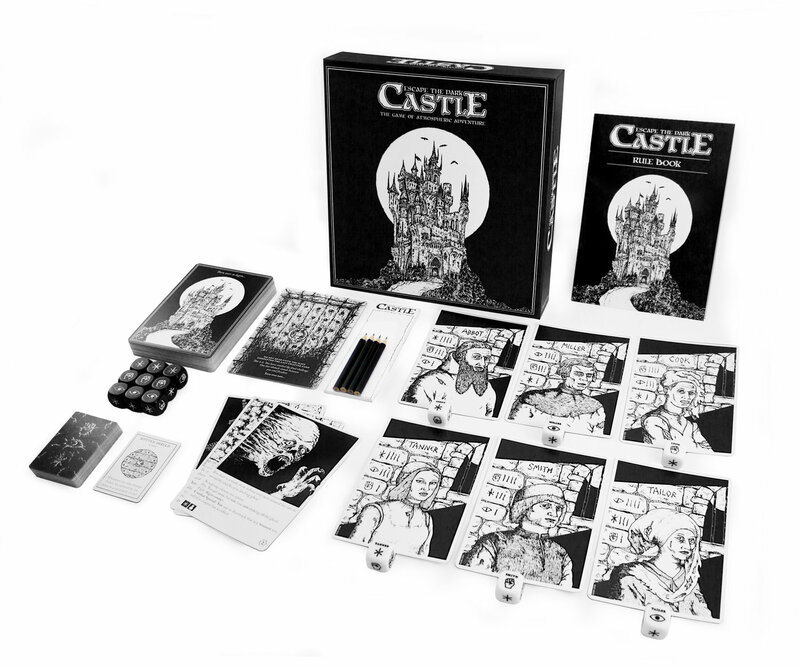 So if you’re a fan of retro choose your own adventure stories, simple yet engaging gameplay, profoundly disturbing monsters and a high possibility of death, then Escape the Dark Castle is the game for you! Escape the Dark Castle is available for purchase for £29.99 and you can order your copy now!